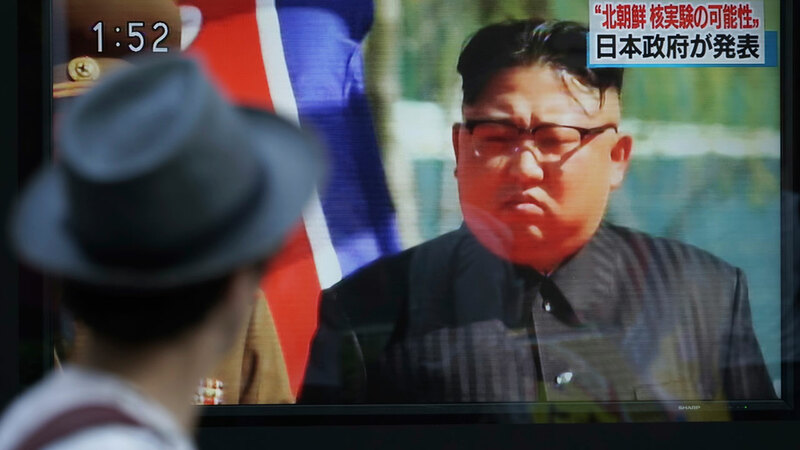 A man watches a TV news program on a public screen showing an image of North Korean leader Kim Jong Un. SEOUL, South Korea -- North Korea leader Kim Jong Un said the country is nearing its goal of "equilibrium" in military force with the United States, as the United Nations Security Council strongly condemned the North's "highly provocative" ballistic missile test on Friday. The North's official Korean Central News Agency carried Kim's comments on Saturday - a day after U.S. and South Korean militaries detected the missile launch from the North Korean capital of Pyongyang. It traveled 3,700 kilometers (2,300 miles) as it flew over Japan before landing in the northern Pacific Ocean. It was the country's longest-ever test flight of a ballistic missile. The North has confirmed the missile as an intermediate range Hwasong-12, the same model launched over Japan on Aug. 29. The KCNA said Kim expressed great satisfaction over the launch, which he said verified the "combat efficiency and reliability" of the missile and the success of efforts to increase its power. While the English version of the report was less straightforward, the Korean version quoted Kim as declaring the missile as operationally ready. He vowed to complete his nuclear weapons program in the face of strengthening international sanctions, the agency said. The U.N. Security Council accused North Korea of undermining regional peace and security by launching its latest missile over Japan and said its nuclear and missile tests "have caused grave security concerns around the world" and threaten all 193 U.N. member states. Kim also said the country, despite "limitless" international sanctions, has nearly completed the building of its nuclear weapons force and called for "all-state efforts" to reach the goal and obtain a "capacity for nuclear counterattack the U.S. cannot cope with." "As recognized by the whole world, we have made all these achievements despite the UN sanctions that have lasted for decades," the agency quoted Kim as saying. Kim said the country's final goal "is to establish the equilibrium of real force with the U.S. and make the U.S. rulers dare not talk about military option for the DPRK," referring to North Korea's official name, the Democratic People's Republic of Korea. He indicated that more missile tests would be forthcoming, saying that all future drills should be "meaningful and practical ones for increasing the combat power of the nuclear force" to establish an order in the deployment of nuclear warheads for "actual war." Prior to the launches over Japan, North Korean had threatened to fire a salvo of Hwasong-12s toward Guam, the U.S. Pacific island territory and military hub the North has called an "advanced base of invasion." The Security Council stressed in a statement after a closed-door emergency meeting that all countries must "fully, comprehensively and immediately" implement all U.N. sanctions. Japan's U.N. Ambassador Koro Bessho called the missile launch an "outrageous act" that is not only a threat to Japan's security but a threat to the world as a whole." Calling the latest launch a "terrible, egregious, illegal, provocative reckless act," Britain's U.N. Ambassador Matthew Rycroft said North Korea's largest trading partners and closest links - a clear reference to China - must "demonstrate that they are doing everything in their power to implement the sanctions of the Security Council and to encourage the North Korean regime to change course." France's Foreign Ministry said in a statement that the country is ready to work on tougher U.N. and EU measures to convince Pyongyang that there is no interest in an escalation, and to bring it to the negotiating table. Friday's launch followed North Korea's sixth and most powerful nuclear test on Sept. 3 in what it described as a detonation of a thermonuclear weapon built for its developmental intercontinental ballistic missiles. The North flight tested its Hwasong-14 ICBMs twice in July and analysts say the missiles could potentially reach deep into the U.S. mainland when perfected. The growing frequency, power and confidence displayed by Pyongyang's nuclear and missile tests seem to confirm what governments and outside experts have long feared: North Korea is closer than ever to its goal of building a military arsenal that can viably target U.S. troops both in Asia and in the U.S. homeland. Robust international diplomacy on the issue has been stalled for years, and there's so far little sign that senior officials from North Korea and the U.S. might sit down to discuss ways to slow the North's determined march toward inclusion among the world's nuclear weapons powers.